We manufacture and supply various types of container cold rooms and freezer rooms, we do have 3 standard size containers, 12ft, 20ft & 40ft units, however we also customize containers to client specification, cold room containers are perfect for temporary use as a substitute for a fixed cold room, cold room containers can be easily moved with a low bed trailer. The potential for a cold room trailer is endless as you can see above, you can use a cold room trailer anywhere in the country to refrigerate all types of products and make money out of them as well, the only requirement for a cold room trailer is a stable stand and a 220V power supply. We manufacture and install all types and sizes of cold rooms and freezer rooms, we are pleased to say that our clients get exactly what they request. We manufacture these cold rooms or freezer rooms to our clients specifications. 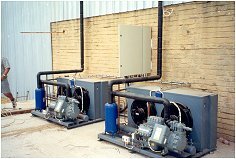 There are many different types & sizes of cold rooms and freezer rooms, to us their is no job to big or to small. 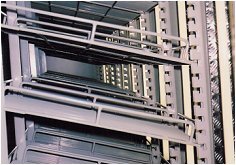 Our panels are made of polystyrene and chromodeck cladding and we use only the best refrigeration (industry leading) equipment. Above is a large 240Ton freezer room, it is very important to do regular services to such large freezer rooms to make sure it doesn't break down with thousands of rands of frozen product inside. 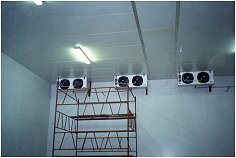 Naturally this large freezer room functions with more than one refrigeration unit to make sure that a acceptable temperature can be maintained, more than one unit also serves as a back up unit, should there be any break downs on either one of them, but it is still important to maintain and service the freezer room regularly. 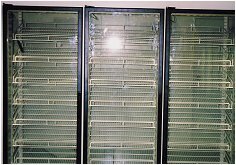 We supply and install many types of glass door display fridges and freezers. For any type of cold room or freezer room requirements, please do not hesitate to contact us for more information or a quotation, we guarantee our workmanship and we strive to keep our prices affordable.